TryCycle Data Systems Inc. proudly announces their acceptance into the University of Connecticut’s Technology Incubation Program (TIP). “TIP is a comprehensive platform providing a unique ecosystem to support innovators and entrepreneurs to succeed through the most critical stages of their journey,” describes Mostafa Analoui, Ph.D., Executive Director of Venture Development, Office of the Vice President for Research, UConn. As a TIP company, TryCycle now has an office in UConn’s state-of-the-art Cell & Genome Science Building on the UConn Health campus in Farmington, CT.
Three dozen participant companies have joined the TIP community, with TryCycle being one of only three software companies selected. 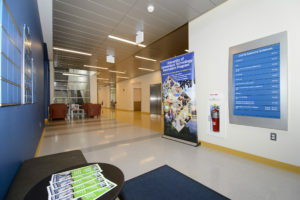 UConn’s Technology Incubation Program (TIP) is the largest university-based technology business incubation program in Connecticut. Established in 2004, TIP couples UConn's world-class research resources, facilities, and business support services with a network of experienced investors and entrepreneurs to help launch high-potential startups. Since 2004, the program has helped over 100 companies that have raised $164.6 million in equity and debt, $62.3 million in grant funding, and more than $50.7 million in revenue while in the program. TryCycle is a bi-directional, predictive software solution designed to help Clinicians who treat and manage patients with addiction, substance use, mental health, depression and post-traumatic stress disorder. An opt-in digital technology that must be prescribed by a health professional, TryCycle helps to create an ‘early warning system’ to identify patients at risk, in between face to face visits and scheduled appointments. Even when a patient is disengaged from providing data as part of their treatment routine, TryCycle continues to provide valuable insights based on movement, location, and sentiment.